KUALA LUMPUR: The stamp duty waiver on the instrument of transfer for first time home buyers announced in Budget 2019 will provide a boost to the current slow housing market, said Knight Frank Malaysia managing director Sarkunan Subramaniam. 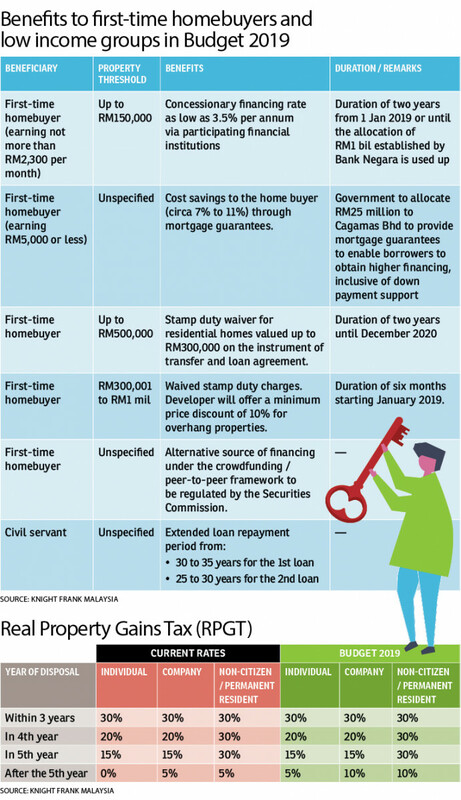 “The exemptions and initiatives, in particular the waiver of stamp duty on the instrument of transfer and loan agreement for residential homes valued up to RM300,000 for the purchase of homes priced up to RM500,000, for a 2-year period until December 2020; and the 6-month waiver of stamp duty charges for properties priced from RM300,001 to RM1 million, are expected to kick-start the housing market moving into 2019 and beyond,” Sarkunan reckoned. The stamp duty waiver for those purchasing a RM300,000 home, for instance, will give first-time homebuyers a savings of around RM5,000. 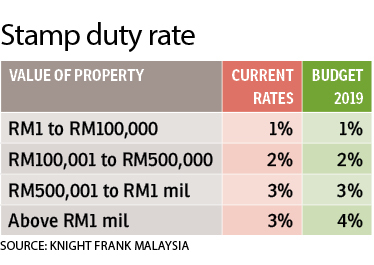 Meanwhile, under Budget 2019, the stamp duty on the transfer of property valued at more than RM1 million will increase from 3% to 4%. As a whole, the real estate consultancy described Budget 2019 —which was tabled in Parliament by Finance Minister Lim Guan Eng last Friday— as a well-rounded national budget that “lives up to their [the government’s] social responsibility of securing the nation’s well-being by promoting economic growth while reducing fiscal deficit”. 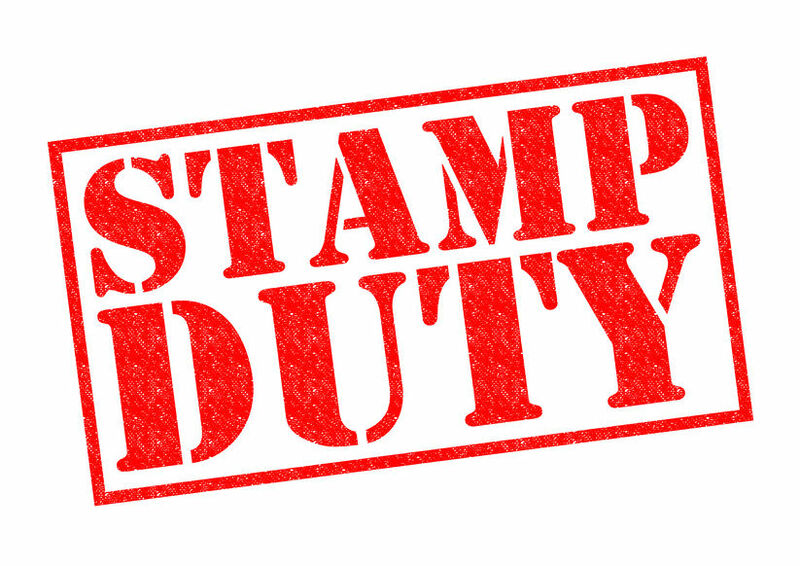 The two key announcements directly impacting the property sector were the reviews on stamp duties and the Real Property Gains Tax (RPGT) rates. The RPGT rates will be revised for disposals of properties (including shares in property holding companies) after the fifth year to 5% for individuals and 10% for companies and non-citizens / permanent residents. However, disposal of low cost, low-medium cost and affordable housing with prices below RM200,000 will be exempted. “Although the review of property taxes will increase the disposal and transfer costs, the impact towards the property market is insignificant,” Sarkunan commented. He cited an example of stamp duty on the transfer of a property valued at RM2 million which would be RM54,000 prior to the revised rate and RM64,000 after the revised rate. The government also announced that there is commitment from the Real Estate Housing Developers’ Association (REHDA) to reduce house prices by 10% for new projects. “While the commitment by REHDA members is neither binding nor enforceable but in the spirit of Malaysia Baru, they (the members) are likely to support the aspiration of the government to promote the National Home Ownership Campaign,” he said. He also welcomed the introduction of property crowdfunding platforms to encourage homeownership. “The availability of property crowdfunding platforms will make properties more accessible for first-time homebuyers who may not easily qualify for bank loans,” he said. Nevertheless, he urged the Securities Commission to ensure the interests of all parties are protected. “There is also a need to prevent fund managers who may be tempted to quickly build a portfolio by lending to borrowers with compromised credibility, possibly disrupting the property crowdfunding platforms. Subsequently, the funds’ portfolios should be reviewed regularly to ensure that the investments are secured,” he noted. On the government’s pledge to return the Goods and Services Tax (GST) and Income Tax refunds totaling RM35.4 billion to the rightful owners, the consultant said such a significant cash infusion will enhance the money supply in the market, which will in turn lead to increased consumer spending and business investments among private consumers and businesses alike. This story first appeared in the EdgeProp.my pullout on Nov 9, 2018. You can access back issues here.